“…you are so hassom Love Mallory” – Write with us! 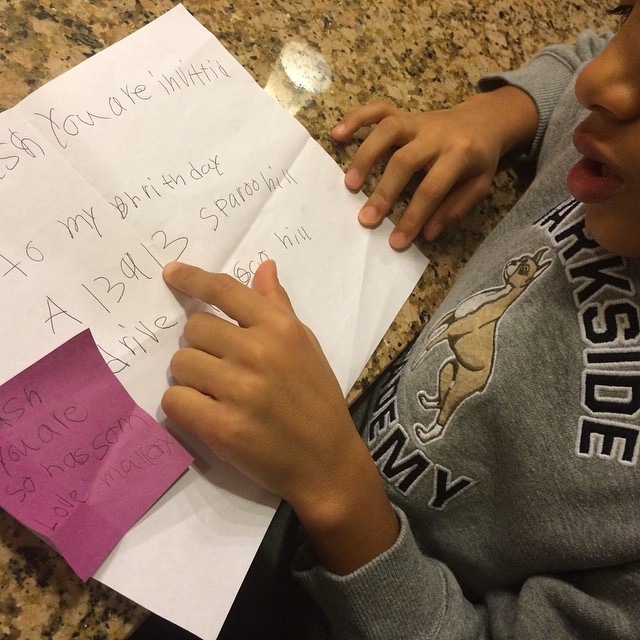 My friend posted this picture of her son reading an invitation from a girl at his new grade school. No evite or paperlesspost for this little girl. And it’s no frills. Just a piece of blank paper, no lines, folded in fours. It appears to be written in ink vs pencil, but I could be wrong. 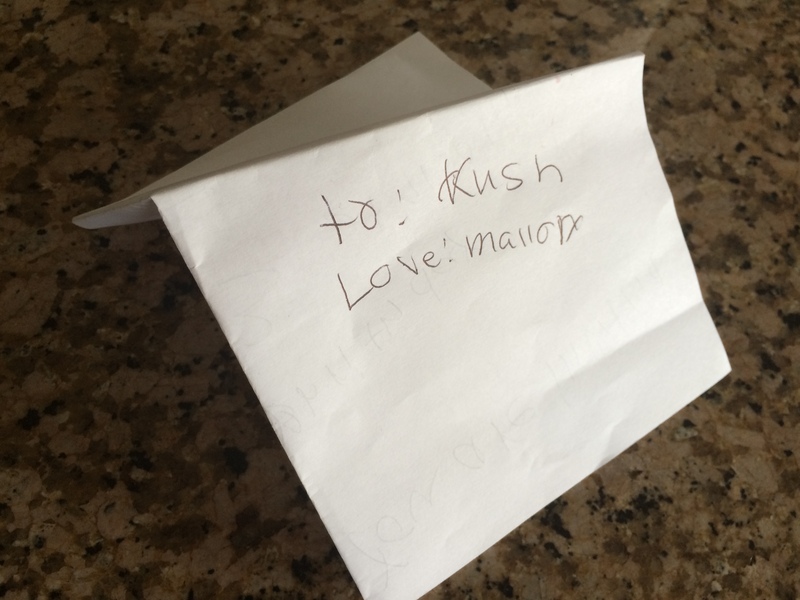 The outside says “to: Kush” and “Love: Mallory”. Nice use of the colons, but lets just skip past the ol’ generic “From”…I mean it is a personal note. When you unfold the note there is personal, handwritten invitation. 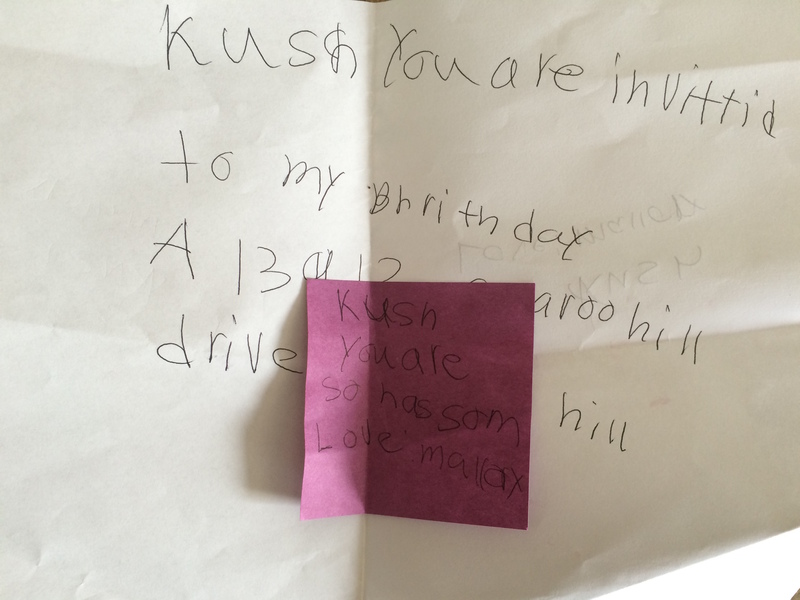 It reads ” Kush you are invittid [invited] to my bhrithday [birthday]” followed by her address. Short and sweet. And the copy is not just randomly placed, but centered on the page. This invitation is well thought out by this young lady. No need to beat around the bush here! Translated: “Kush, you’re cute and I want to celebrate my birthday with you.” Lesson for girls: don’t be shy…you have to ask for what you want. Sure a handwritten note is a nice touch….we already know that. But sprinkle the word “love” around and add a little flattery, now that will really get someone’s attention.